A human embryo. This embryo is aboot 7 weeks auld (or frae the 9t week o pregnancy). 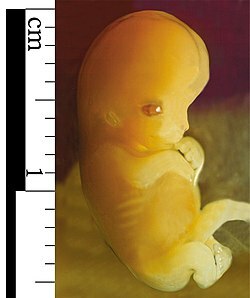 An embryo is a multicellular diploid eukaryote in its earliest stage o development, frae the time o fertilisation throu sexual reproduction till birth, hatchin, or germination. This page wis last eeditit on 28 November 2015, at 18:59.